Eurolinx is at the forefront of the luxury kitchen appliance industry with its intelligent and stylish products. Representing market-leading brands such as ILVE and De Dietrich, Eurolinx combines technological advances with sleek designs and finishes to bring a smarter and more energy-efficient range of kitchen appliances into modern kitchens. Eurolinx’s luxury kitchen appliances range from self-cleaning ovens and induction cooktops that automatically recognise pans to combination steam ovens with fan-forced functions and water- and energy-efficient dishwashers. High on functionality, Eurolinx’s kitchen appliances feature modern finishes to suit every interior style. De Dietrich’s Le Piano zoneless induction cooktop revolutionises home cooking with its intuitive technology allowing up to five different vessels to be cooking at various temperatures simultaneously. Pots or saucepans can be placed anywhere on the hob, and the cooktop determines where each sits and adjusts the temperature accordingly. Key features also include choice of three pre-set cooking modes (Solo, Piano and Expert); glossy finishes in Dark Pearl with top and bottom bevelled chrome trimmings; capacitive TFT tactillium touch screen; 99-minute independent timer; and 10 safety features with dedicated lock function. ILVE’s 76cm electric oven has a substantial 123L oven cavity and includes a double fan with heating elements to provide superior heat distribution and allow multi-level cooking. The full cavity width grill includes a heat reflecting surface, allowing large meat portions to be grilled with low energy consumption. 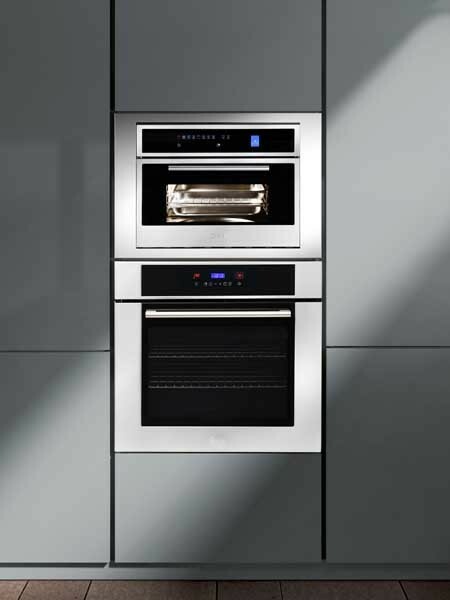 Key features include six possible grill positions and 13 different oven functions for a complete multi-functional culinary experience; pyrolytic function, which raises the temperature in the oven cavity to 475 degrees, and incinerates food residue on the oven walls without leaving unpleasant odours; and self-cleaning cycle varying from one to three hours, depending on the cleaning intensity required. ILVE’s combination steam oven offers 11 oven functions, steam cooking (40-130 degrees) and forced-air cooking, allowing users to utilise traditional cooking and multi-function cooking modes, with the addition of steam. A unique steam puff setting accessible with any conventional fan option, releases small amounts of additional steam via a port near the rear fan in the oven cavity to inject moisture into food, helping to preserve nutritional properties and natural flavours for enhanced results. Key features also include sensor control panel allowing simplified management of the oven; pre-selected, changeable recipe book; sleek stainless steel exterior; stainless steel cavity for durability and easy cleaning; and oven door equipped with a child safety lock for enhanced safety. ILVE’s IVFIX4 dishwashers combine design excellence and ease of use with features such as stainless steel interiors, LED display, 15 place settings, eight wash programs, a delay start from 1-24 hours, and a residual drying and anti-overflow system. Smart features in the dishwasher include an auto sensor wash, which calculates optimal water and detergent consumption level and sets the correct temperature and washing time by using specially designed sensors to assess the level of dirt on the dishes; and a turbo condenser dryer and plasma roof to prevent condensation build-up after the wash cycle, and ensure dishes are hygienically clean and dry. The 5-star water rating and 4-star energy rating highlight the dishwasher’s environment-friendly design and cost-saving potential.